Ideal for medical workers and those involved in cleaning up bodily fluids and bio-hazardous materials. Prevents hair from falling easily into treatment or contaminated areas. Protect against accidental needlesticks with proper disposal of used syringes. Locking top flap permanently closes to protect against accidental exposure and unauthorized removal. 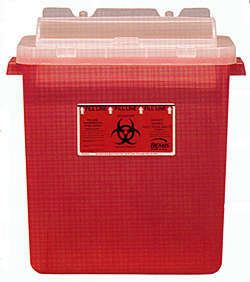 Our Bemis 2 gallon Sharps container is designed to provide the features you require. The container provides open access for disposal of a variety of shapes and sizes of sharps, (i.e. needles and syringes, vials, test tubes and glass slides) in controlled areas such as nurse's stations, med carts, laboratories and pharmacies. The lid features a needle key for the safe removal of needles when necessary. Bemis two-gallon containers can be wall-mounted or used freestanding. 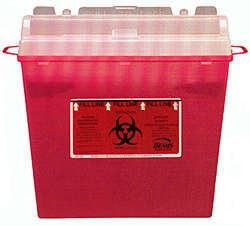 This Sharps container is latex and heavy metal free for added safety.